What days are your cooking classes available? They are available every day; on Sundays there is no market tour because the market is closed. What time do your cooking classes start? The morning classes start at 9:30 AM, and the afternoon classes start at 3:30 PM. On Sundays, the morning classes start at 10:00 AM. Where do your cooking classes meet? The morning classes meet in Piazza Farnese. The afternoon classes meet directly at our studio/kitchen, which is located on the Tiber River near the Vatican. 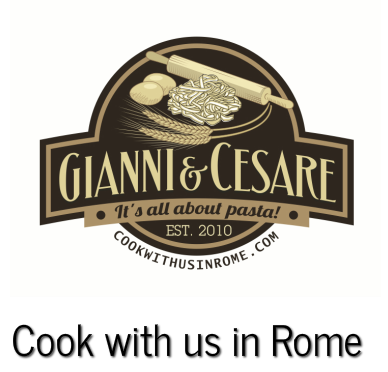 Upon confirmation of the tour, you will be given exact instructions on where to meet Gianni & Cesare for your cooking class. How long do your cooking classes last? They last from 4 to 6 hours; it just depends how many people we have cooking with us, what the menu is, how quickly everyone eats, etc. Are Cook with us in Rome's classes hands on? Yes, they are! You will chop tomatoes, make your own pasta dough from scratch, learn how to make pasta with a pasta board, clean your own zucchini blossoms, etc. Everyone gets to be involved! We do NOT, however, have separate burners for each guest, so we will cook together over the main burner, but all the rest of the prep work is shared by the whole class. Are you located far out of the city center forcing us to ride the metro or a bus to reach you? NO, our meeting point is right in the center of the city, and our cooking class studio is located in the center of Rome, too. You won't have to leave the city to cook with us! Why waste your valuable time in Rome on the subway? Yes, we do. Contact us for more info and availability. Can you take into account allergies and intolerances? Yes! We can work with any type of allergy or food preference if you book a private lesson. We are happy to fix vegetarian or vegan meals, gluten-free pasta for celiacs, and we can even work with kosher diets! It is very difficult to accomodate strict dietary requirements or allergies in our group lessons, but we are happy to create a special menu and cooking class just for you in a private lesson. Please contact us for details more info. We are happy to help! What dishes will we cook? You'll make 1-2 antipasti, 2 or 3 types of home made pasta for scratch (ravioli, fettucine and cavatelli), and a dessert. Please note that for our small-group lessons we set a menu in advance depending on what is in season. We cannot make special menus, nor specific items during our small-group lessons. If you have a specific item you'd like to cook in mind, or if you'd like a special menu (example gluten-free or dairy-free etc), please inquire about booking a private lesson. What is included in the price of your cooking classes? THERE ARE NO HIDDEN COSTS! Everything is included: food tastings at the market and market tour (for morning lessons only), all the ingredients to cook your meal, wine paired with your meal and the recipes. How many people will be in your class class? The classes are small and intimate, with a maximum of 10 people. Is your cooking class suitable for children? Yes! We love kids, and kids love to get their hands dirty and make their own pasta. We offer a discount for children, contact us for more info. Check out our photo gallery for lots of photos of kids having fun cooking with us. What languages do you speak? Can we take your cooking class even if we don't speak Italian or English? All our classes (and food tours) are held in English. Contact us to see if we can teach a private class in your language. Even if we don't speak it, we could hire an interpreter if you wish. Will we have to wash dishes? No, we have a kitchen helper who takes care of all the dishwashing. So you can relax, drink you wine, cook and eat without having to worry about washing. Will we have to write the recipes down as we cook? No, we will email you all the recipes so you can replicate them at home. Do you have reviews or testimonials? Yes, please read the reviews about us on Tripadvisor or on our Facebook page. Can I take your food tours if I don’t eat or drink specific foods like pork, meat, cheese, gluten, alcohol? Yes, you can. Please let us know about your specific dietary requirements when you book. What time do your food tours meet? The morning food tours meet at 9:00 AM; and the evening food tours meet at 3:30 or 4:00 PM depending on the season. We will send you more precise info when you book. How long do your food tours last? Is this class suitable for children? Absolutely! Cook With us in Rome loves working with kids! We are very family friendly. Please let us know your kids’ ages when you book. How big are the groups for the food tours? We like to keep our tours small and intimate, just like our cooking classes. Most of our food tours have 6-8 people, but they can have up to 12 people. What languages are your food tours in? All our food tours (and our cooking class) are held in ENGLISH exclusively, unless you book a private tour.